Kolkata, March 26: All eyes will be on R. Ashwin in the aftermath of the 'Mankading' controversy when Kings XI Punjab and Kolkata Knight Riders (KKR) lock horns in an Indian Premier League (IPL) clash at the Eden Gardens on Wednesday. Punjab made a dramatic comeback to beat Rajasthan Royals by 14 runs at the Sawai Mansingh Stadium in Jaipur on Monday night. But the match was marrred by an incident in the 13th over when Ashwin reignited the spirit-of-cricket debate by running out non-striker Jos Buttler without bowling the ball. KKR Squad in IPL 2019: Team Profile, Schedule of Kolkata Knight Riders in VIVO Indian Premier League 12. The senior India Test off-spinner later termed his action as 'instinctive' but the wider cricketing world were left divided in their opinion. Ravichandran Ashwin Mankads Jos Buttler as Kings XI Punjab Beat Rajasthan Royals by 14 Runs in VIVO IPL 2019, KXIP vs RR. 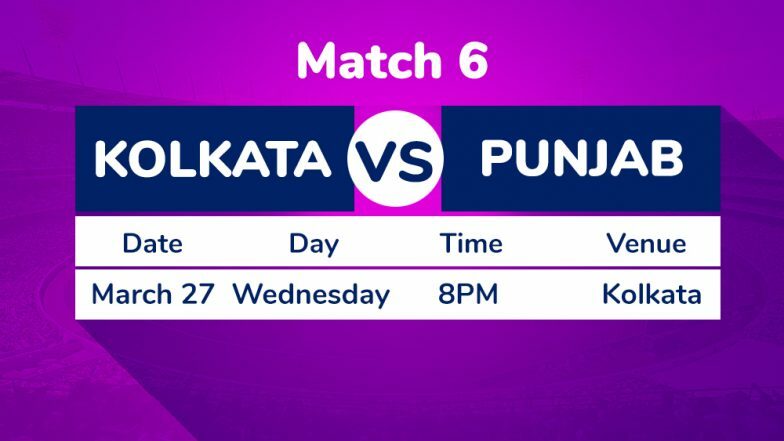 Punjab skipper Ashwin will once again lead his side against KKR with both teams looking to build on their opening game wins. IPL 2019 Schedule in PDF for All Matches: Download VIVO Indian Premier League 12 Full Timetable With Fixtures, Dates, Team and Venue Details. KKR were in the dumps at home against Sunrisers Hyderabad till the 16th over, chasing 182 for victory. Needing 53 runs off 18 balls, the two-time champions banked on big-hitting West Indies all-rounder Andre Russell to fire once again and he did so in style, smashing a whirlwind unbeaten 19-ball 49 to take the team over the line with two balls to spare. KXIP Squad in IPL 2019: Team Profile, Schedule of Kings XI Punjab in VIVO Indian Premier League 12.